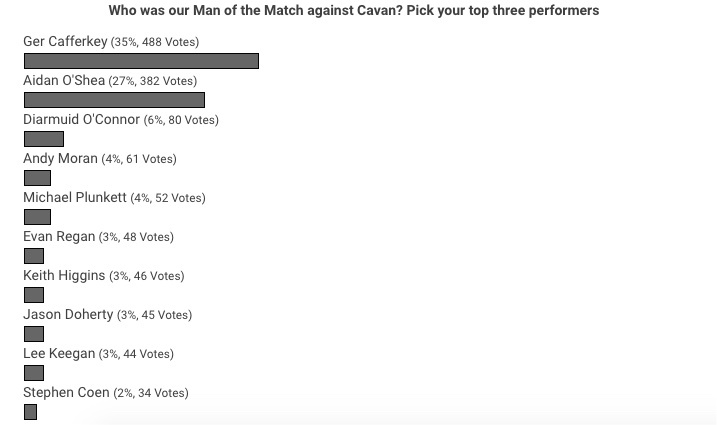 The votes are in and counted in our third Man of the Match poll of 2019. This time the voting was reasonably close but we have a clear winner in the poll and he is Ger Cafferkey. He wins the MOTM award with 35% of the votes. Ger put in a real no-nonsense masterclass for us at full-back last night. Every time the ball came the way of his man Ger got a hand or a foot in to break up the attack. He was cool and composed from start to finish and his display at the back was one of the main reasons our goal was never in danger of being breached. While Ger’s performance last night was outstanding – he won the MOTM award on Eir Sport as well – Aidan O’Shea’s display also deserves mention. Aidan has been in super form so far this year and he put in another serious shift around the middle against Cavan. His contribution to the cause is recognised by the 27% share of the vote that he polled. Others to feature strongly in this week’s poll were Diarmuid O’Connor (6%), Andy Moran and Michael Plunkett (both on 4%). Well done to all of them. A practical way to recognise the lads’ good form on the field is to play the Mayo GAA Lotto. The jackpot prize on offer in this week’s draw is €12,100, with tickets for the Dublin game and hotel accommodation in the capital that weekend up for grabs too. You can play the Lotto here. It will be interesting to see whether Caff or BH starts against Dublin. It’s going to be a serious test because if Dublin win they’re back in the hunt for a league final whereas if they lose it’ll be a relegation battle. JH will want to beat Dublin big time (and rightly so) however he’ll have to give some youngsters game time for experience purposes – they have to get a proper test! Did you notice how disappointed Gavin was after the Kerry match in his post match interview? Trust me, they’ll be gunning for us and in the case of Caff he has to decide whether he has the pace for the young and fast Dublin forwards. There’d be no shortage of comments if someone else got MOTM! Credit where it’s due. Savage performance. Spotlight – couldn’t both of them play? A full back line of Harrison, Caff and Higgins. I think Ger would be well able for Rock or Andrews if they start but the other Dublin forwards may have too much pace. I dion’t think that Ger will be caught for pace no matter who Dublin play full forward. I hope James goes for Reape, McDonagh and Diskin in the forwards and Plunkett in defence. They are, in my opinion, our top four newcomers this year and have earned their place against all comers. I would also like to see McCormack and Tracey getting gametime against the Dubs. This is a game which, along with the Kerry game, will tell us much about where we’re at in spring 2019. Results to date have been a little confusing to me, good as they appear to be. Indeed results in both top two divisions appear to be confusing as there appears to be little consistency in them. But I suppose that keeps it interesting. AndyD Isn’t it a Beautiful thing to wonder again? Who starts? It’s a breath of fresh air. Just realised that our date with Kerry is on 16th March – Paddy’s weekend and all that means to accomodation etc. Been on google to find – as expected – that over a month out it’s scarce and expensive but got a spot at a reasonable price. If you’re going south and haven’t booked a spot I’d advise – get moving. By the way, unusually our date with Kerry is fixed for Killarney. Never been there for a Saturday night game yet. Andy D You’re leaving it late to plan away days. Did you not get the fixture list? AndyD Kerry play their night games in Tralee under lights this game is in Tralee according to the list I have . Hi guys, I was happy for Ger and his performance and his deserved MOTM award. Best I’ve seen him play in recent years. We are coming together as a team with James in charge again and it looks like we’re reintroducing our attacking running game which, when we do it right is unstoppable by ANY team. Still a few things to iron out like giving the ball away and not having support all the time for the man with the ball. But our tackling (which brought us to the heights we’ve experienced in the past decade) is the one thing I’ve noticed is getting back to its intensity of a few years ago. Keep it up guys. Now, all that said and done, we have to mention Andy Moran!!! Playing his 171 game for Mayo he capped it off with two points that brings his tally to 20-200 for his efforts. What a fantastic achievement by any standard you may look to measure him by. He continues to deliver for his county and younger players could do no better than to follow his example. I’ve spoken with Sndy on several occasions after matches and what stands out still is the passion he has for his jersey! Well done Andy on reaching such a great milestone. I hope you continue injury free for a few more years. Thoroughly enjoyed the game on Sat. Now, bring on the Dubs! Well done to Ger… I dont know him but he comes across as a really decent guy who has always given full committment to Mayo. He had a super game Sat night. Strange to see so few comments in general after a win… people are never slow with the comments after a loss! Anyway well done Mayo 6 points from 6… a few tough games ahead now so lets keep it going. And thanks also to the Mayo players for the autographs/photos etc on Sat night so nice to the kids as always. Well watching league Sunday last night you wouldn’t even have known Caff was playing. Dolan was too busy reading from the “Mayo 2015 punditry script” to notice. Hopefully we can build on this. The start is positive but its looks like we got the weakest 3 teams first in the league so that has helped our position. We need to win against either Kerry or Dublin to build confidence. Tomás, I’m glad you raised the tackling thing actually. All too oftne I think Donie Buckley got the credit for our excellent tackling, but after Horan left, that definitely declined. It’s creeping back in again. Great to see. The contrast between Aaron Kernan on Eirsport and Dessie Dolan on RTE is stark. Dolan with the bland colour commentary shitetalk, Kernan actually analysing the game. RTE is a disgrace and so are all who sail on her. Credit to Caff but take off your Mayo glasses and Brolly has a point…is Caff the answer at FB going into the summer? I hope he proves me wrong but I don’t think so. Paddy – I don’t believe what RTE offer is Analysis, rather simply its just bluster. To be fair to Joanne Cantwell, she’s showing a lower tolerance for BS than her predecessor so it’s a step in the right direction, but they’re still miles behind the rest. For all the talk about making the games free to view – our licence fee pays for that rather poor product. yew_tree – Its a nonsense point this early in the year and mayo glasses have nothing to do with it. Caff was exceptional Sat night, absolutely exceptional. Its great to see a guy come back and prove he still has something to offer after been written off. But that’s as far as the story goes for now and speculating on where that story goes in 3/4 months time is pure guff after one decent league performance. @AndyD you put the heart crossways in me! Youre talking about how expensive and scarce the accommodation is in kerry that weekend,im thinking “thank god i booked it months ago” and then you go no to say its in killarney! Well fair duce to Ger. A brilliant performance. Well deserved. Aiden excellent – no danger Brolly would acknowledge that. Players so good with all the fans and kids afterwards. Also well done to everyone who called out the s… that was put up on facebook pages over last few days. Delighted for Ger. If nothing else, he is proof that if you keep plugging away and never give up, you will get rewarded in the end. There are not many players that have received such criticism from their own supporters as Cafferkey has over the last number of years. People seem to forget that he has barely been injury free since 2015. Back then, it was plain to see, that he was suffering from lower back and hamstring problems. This, eventually in 2016, resulted in him suffering a terrible hamstring tear that ruled him out of action for well over a year and indeed, caused serious doubt as to whether he would be able to get back to the physical levels required to do the job of an inter-county player. Paul O’Connell suffered a similar injury and he never played again, Ger is an amateur, with a day job, so the fact that he is back playing at all is testament to his determination. It was obvious that in 2017, and when he played last year, that he was tentative and almost “minding himself” during games. You would often see him stretching his calfs and hamstrings throughout games so hopefully his injury worries are behind him. It is a big ask for him to get back to his All Star levels of 2012 but there is no doubt that his calmness, experience and ability to read the game further out the field are still valuable attributes. His style may not be effective against every forward but on a “horses for courses” basis he certainly has a part to play. Congrats Ger!! Only way to answer the critics is on the field. Let’s hope you stay injury free and build on your confidence. Keep it up!! I also think JH is bringing out the best in his players, taking them aside, coaching them and building their confidence. I also see discipline has improved which has cost us dearly in the past. Mhuigheo for such a solid start to the season. I thought Evan Regan did well and he gets lots of negative comments (as does Ger) on this site. After all, his first half goal was the difference between the teams after all! 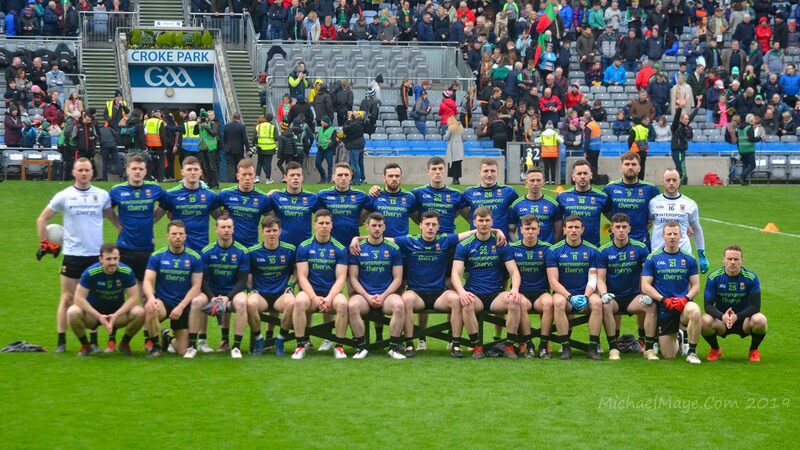 In my view, negative comments mentioning certain players is totally uncalled for as these lads are amateurs and are giving their very best for the Green and Red. Lets keep it going lads and lets be positive! Bigi linn! Are we playing Kerry in Tralee or Killarney? I’m really happy for Ger – firstly for putting in such a splendid performance which I hope will do his confidence the world of good. He really was back to his brilliant self on Saturday night and now I hope he can replicate that form; we need options in the full back line and happily, now with the return of Barrett and Harrison and the flexibility of Stephen Coen, it looks like we might not be as badly stuck there as we thought. Incidentally I thought our defending was heaps better on Saturday night and as other posters mentioned, the intensity of the tackling was noteworthy – there were times when they were like men possessed. Secondly, I’m also glad for Ger – and his family, who are thoroughly decent people and have had to ensure some seriously appalling commentary over the past while – that he for once received some credit for another solid performance – not his first of 2019, it should be noted. I hope Evan Regan’s injury isn’t serious. Whatever your opinions on him as a player, it is very obvious how badly he wants to succeed in the Mayo set-up and how hard he has been trying, and for a young player he has been desperately unlucky with injuries in recent years. And as for Joe Brolly, the day we start relying on his insight for guidance is a day we will be desperate indeed. His punditry is weak, he is incapable of objectivity and his lack of ability is concealed by his tendency to garner cheap headlines. His failure to acknowledge Aidan O’Shea’s contribution on Saturday night sums this up, and for the life of me, I cannot understand how we as a county still afford him any respect as a pundit. Great to see the improvement right through the Mayo panel, amazing what a change can do. Kerry and Ros have also hugely benefitted with new managers also. Gavin persisting with McMenamin, his legs seem to be gone. Gavin persisting with Andrews, this guy has not played well for the Dubs since he was shell shocked by Barrett in the 2017 final. Gavin’s subs were brought on too late v Kerry and they didn’t work. Paul Flynn no longer able for the top-flight. The new guy at midfield v Kerry won’t make the cut this year. Kerry beat a Dublin team with pure high pressure / attacking football, Moran was very influential when introduced, note, the Kerry goaly gave the ball away with 50:50 kickout to midfield in injury time. Mayo will be playing the Dubs in Croker, this pitch is much faster / better condition than McHale Park. The ball into the defense will be of much better quality than Cavan’s on Saturday last. Somehow Mayo will need to plan for Cluxton’s kick outs when that meet on Saturday week. I am wondering if Dublin have one eye on the championship and are not too bothered about the league, but another Dublin defeat well put doubt into them, and hopefully set them back. Ah Jaysus lads, will ye just look to the top of this page, click on the tab that says 2019 FIXTURES, dates, times and venues can be found. Kerry had a good 4/6 weeks training on Dublin and still only beat them by a point with 14 men, I wouldn’t be writing them off just yet. Looking forward to seeing how we fare against them in Croker after nearly a year and a half, I believe JH is a different man from 2014 and for the better. 6 points in the bag, some of the new lads showing real promise and the older lads looking reinvigorated. It’s a nice place to be in February. Wingers is a term Id use to describe Dessie and Joe..No substantial analysis really of any match..Alot of chuckling about the rosy future of Kerry football a week after they were nearly beaten by Cavan..More dismissal of O Sheas positioning after a super display on Saturday night ..And lets drag Boyle(who was a SPECTATOR on Saturday night) in for good measure because he’s old..At 32 he’s a year older than Diarmuid Connolly..Actually wingers is too decent a term for them ..
Any update on Regan injury? Some people on here think Horan won’t be too worried if we don’t win.I don’t buy into this .No one wants to lose that’s what drives lads to be the best .For sure the young lads will be given their chance to shine and the Dubs will be out to lay marker down against us .My concern is midfield .We are definetly light in this crucial area .Our intensity in tackles and our work rate will be there for sure but we need to be dominant around midfield. So only got to see highlights of the game. Family down with a bug so had to stay put…not to despair I thought I will stick on the fire and watch match on Eir with my feet up..only to wake sat morning and realise storm eric had done a job on my sky dish. So basically I am watching the two boys analysis and concur with most views on here…it’s not really analysis..in fact even winging it would surely involve some level of effort…so definitely a level even below that. I know there are games where they have to rely on highlights only but on the basis the game was shown live the night before surely they could have made an effort to actually watch it..which based on the boys observations would make me hazzard a guess they hadn’t…of course maybe storm Eric had fecked up their sky too. I can only describe Dessie’s voice that if it was a colour it would be the begiest of beiges..and well J B is J B…all bluster no sense. I noticed someone commented on Joanne Cantwell being a bit abrupt and she may have been but at least she wasn’t afraid to call the boys out on some of the nonsense that was being spewed. As for the dubs..they may have taken their eye of the league this year but be in no doubt come championship time they will still be the benchmark…even if the levels are not quite where they were a couple of years back. Kerry looked very good attacking but really look like a team that would struggle with a pacy team running at that defence. Looking forward to the Dublin game but with a slight sense of trepidation..they are most definitely not going to want to lose another game whether they are taking the league seriously or not. I think it would do our lads a world of good to get a win against them but feel it may be a step too far at this juncture. It would be good to see a big performance from the boys back in hq…we have been away too long. There was no analysis on RTE, mentioned pacy wing forwards, an old wing back and an ineffective 11 for Mayo but none of it based on the actual cavan game, Dublin v Kerry being the redemption of football and it not even valentines day and a rant about Kevin Walsh followed by silence when Galways goal and Shane Walshs sublime point taking was shown. Beyond a joke at this stage. Has anyone else noticed when Dessie Dolan starts talking about Mayo he uses the term “experience” in every sentence?! It’s a wonder RTE let him and Joe Brolly away with it. They don’t even try and come up with some original analysis. RTE website has us in Killarney on 16 March, at least it had until this morning. Matters little to me anyway as my digs for the night is about halfway between the two. Not everybody can plan their trips weeks/months ahead, I’m afraid. Did anybody hear Pat Spillane on Saturday night on RTE after the Kerry Dublin match? I nearly drove across the ditch when he said that Kerry won because they took their gameplan from Mayo’s book and attacked the Dubs. I thought that he would only recognise a Kerry book, even if it had to be rewritten. If a friend hadn’t said he heard him too I would be thinking I had dreamt the story. Whelan said Sat night that Kerry should be playing Dublin every Summer in championship. Of course no one in the panel told him they would- If Kerry had been good enough and were not knocked out by better teams before they were due to play Dublin. The more hype about Kerry and Dublin the better. “Not an exact date (on O’Connor) but he is progressing really well,” said Horan. “Cian Hanley is doing very well, Ryan O’Donoghue as well and Tom Parsons is making great progress. Hello everyone. This is my first comment in ages though I’ve been following all the other comments. Great to have little things to get excited about. I too want to congratulate Ger. And I’ve been wondering since Saturday too – how is Evan Regan? I hope he’s well. Have a nice evening, everyone. P.S. I’m looking forward to the match against the Dubs in two weeks time. I’m hearing Evan has a minor ac tear with the prognosis being he’ll be out for 3/4 weeks. Jesus we are not much wiser about injured players from Horans statement above!! Horan well help to conduct himself in interviews. Talks away and doesn’t make any rash statements. @ Mayomad, my reason for asking on the venue was because an earlier comment had mentioned Killarney. I did look at the fixtures. It said Tralee, hence my query. A strong team there TH… and I’d agree with not starting Andy. No sign of Boland? i’d also give him a start instead of Mcloughlin. It’s not like Bolan is a kid anymore. He is 24. Time now to step up to the mark and see what he can do in Croek Park. But i’d start Ruane in the centre and give him the full 70 (and actually give Diarmuid a break, bringing him in for 2nd but not necessarily for Vaughan -( on a huge pitch like croker you need your athetic guys on the pitch) and I’d also start Coen. The more games he gets the better he seems to be. The big questions on him so far this season are ‘how will he do in Croker v a team like the Dubs – well Saturday week is the ideal testing ground. I sure as hell wouldn’t want to be testing it in the summer). Subs: Definitely give Barrett a good 25/30 mins in 2nd half. Give some of Treacy/McCormack/Loftus/Seamus runs. Maybe bring Keith on around half back line/centre in last 15 mins. You could bring Kevin in for last ten mind around middle if vaughan has run out of gas and diarmuid too would be into the middle third when he comes on. Exiled in Dublin – thanks for that bit of an update on what you’ve heard on Evan’s injury. I’m glad we haven’t been hearing anything more serious (although if it is an AC injury, it is undoubtedly uncomfortable). Let’s hope he is OK.
Hi, another match in castlebar, same problem with season tickets not registering attendance. 2 out of 4 didn’t register. In Tyrone last week there was no problems. Has enyone else have problems again this week? Sorry Willie Joe….. I know its a football blog! I like that team TH ! How does everyone think Cillian will fit in to the new Mayo??? No disrespect to him but we now have good scoring forwards with pace and the stamina to run all day. His biggest fault in previous seasons has been his discipline on the field, and I feel this is somthing JH will have to address. He now needs to forget about beating scoring records and blend into the new set up. Hilly Bits – I think it’s a bit early to say how many top new forwards we have. Evan Regan and Colm Moran started the last night. With the greatest of respect to those 2 guys, Cillian is well ahead of them at this moment in time. Also, Cillian’s job as a forward is to score. Scoring records are just a side effect of that. Would like to see Treacy/Ruane get some game time with a bit of Colm Boyle if the game is in the melting pot. I can’t see Horan dropping Ger Caff now but that’s just my team. Athletic, dynamic and enough scores in it to trouble the boys in blue. Hilly Bits – fully fit Cillian will be our captain. In form he is one of the best forwards in the country. Agree on discipline but JH will sort that for him and anyone else on the team. I’d like to see Ruane playing against the Dubs. Think he’s doing well and this game would do him the world of good. I was discussing after the weekend that I was a bit worried. Thought the Kerry v dublin match seemed a couple of gears ahead of the Mayo v Cavan match. I was told not to worry and that Mchale park is a stickier pitch and we’ll be much closer to the kerry / dublin tempo on a different surface. It sounds credible. Hoping this to be the case as there did seem to be a gap in in terms of speed of play between the 2 games. Good Man Hilly bits, saying no disrespect then proceeding directly to disrespecting the captain. Cillian doesn’t give a shite about scoring records, probably doesn’t even know what the records are, he just cares about winning. The records crap is just hype built up on social media. Cillian will be the Captain this year and one of the first names on the team sheet come championship. Cillian will have no problems operating in Horans setup, players of his class can play in any team. Cillian is the ultimate team player, he’ll be willing and well able to play in absolutely any type of team set up. Like the look of that team TH. The only possible change I’d like to see is O’Donoghue in for Higgins if he needs a break. Although the way he’s playing right now, he’s looking fitter than ever and in flying form. He’s looking that good that I even stuck a bet on him at 66/1 for player of the year! Mayomad, I have the greatest of admiration for Cillian as a footballer but his indiscipline has let the team down in the past few seasons. I think that he needs to focus on what he does best and that is getting and creating scores for others in better positions…. Not back in his full back line or getting involved in silly afters and picking up a card needlessly. Hilly Bits, I would agree that Cillians discipline can be better on the field. However in my post I was referring to your suggestion that Cillian was preoccupied with beating scoring records. That suggestion is in my book very disrespectful to one of our players and the Captain of the team. On the issue of Cillian tracking back and appearing on the full back line, there seems to be an assumption that Cillian does this off his own bat (insulting to Cillian and indeed management? ), wouldn’t the more plausible reason be that he was following instruction from management. In the modern game corner backs have to be tracked, how many crucial tackles/interceptions has he made doing this. While it isn’t great to see forwards in a defensive position, someone has to do it and Cillian is a better option to put in that work than say Andy. Think the Cavan match showed us what its like to have quality seasoned subs coming on towards the end to finish strong. Game was still tight and we were getting a bit flat when McLoughlin and Vaughan came on. They both got stuck in and won some dirty ball and we looked steady. Reapes point was the icing on the cake. Can you imagine still being in a game against Dublin/Kerry and when things open up you have one or two from Mcloughlin/Andy/Cillian/Reape to come in and go strong for 20/25 mins. Can be hard for younger players to make a difference in 20 mins but if the likes of Diskin started and gave his all for 40 mins his marker would be well shook and not looking forward to finishing out the game on a fresh Andy Moran. Was the first time I headed to the bar in the Castlebar clubhouse after the match to meet a few friends. Decent crowd and good atmosphere afterwards. Sorry, I am struggling to remember when Cillian’s alleged indiscipline has let the team down in the last few seasons. Can anyone elaborate? I remember one incident against Galway in the league. After that…? And any evidence of him only being concerned with scoring records? Not sure either Kerry or Mayo could take the dubs in Croker in February to be honest. We were very impressive last Saturday night and were very clearly playing like men possessed, that’s what the dubs bring to town I guess. When you are playing the metropolitans it will bring out the best in all teams that are in the shake for honours later this year. Galway are next up for us and they could very well beat us in Tuam on Sunday week, it’s hard to produce two top performances in february. Mayo will have no bother rising to the occasion in Croker but that stadium is worth 3-4 points in home advantage so ye will struggle to turn them over i think. Delighted for Ger Caff as he is a very Clever defender but he is definitely a horse for a particular course. Most teams have a forward that he can nullify with his instinctive skills but he must be matched with his skill set and not the number on his jersey. A confident cafferky is a very good card in Horans deck. Mayo Mad, ok maybe Cillian himself is not preoccupied with scoring records but he will hear plenty about it in summer. I personally would prefer to see him closer to the opposition’s goal than ours. We have half forwards that can track back and cover runners from deep, he does not need to be everywhere. 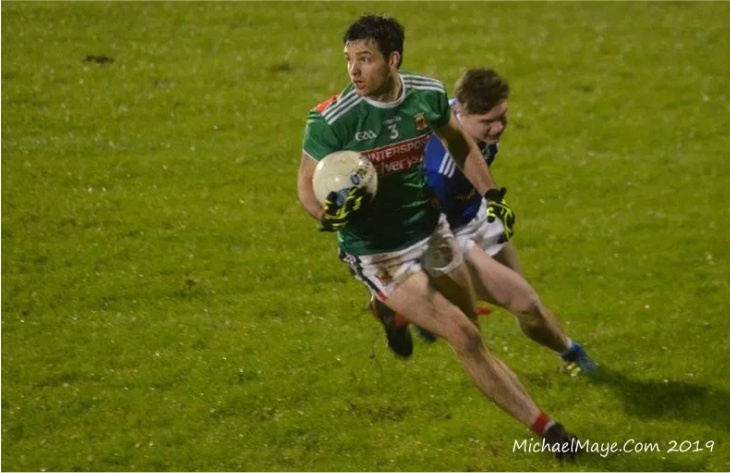 Mayo Mark, if you watch his style of play closely you will see he plays very close to the edge and with the black card now becoming a sinbin we cannot afford to be down to 14 players on the pitch for 10 mins, or worst case longer, and especially someone of his talent. That’s grand Hilly, but when did he this let the team down in the past? Lee plays close to the edge as well. Paddy is an absolute wind up. Just like to bump this. When has Cillian’s discipline let us down in the last few seasons? I think it’s fair to ascertain that “last few seasons” means his discipline has let the team down on multiple occasions? Don’t think you’ll get a response MayoMark, but its certainly worth asking the question as it’s a puzzling assertion, as well as the initial assertion that Cillian was concerning himself with records, which is utter horsemanure, to be honest.